Hello, my first post on this site. Glad to see the Squarebirds open this forum to the two seaters. We recently purchased a '57 that has been modified by a previous owner. 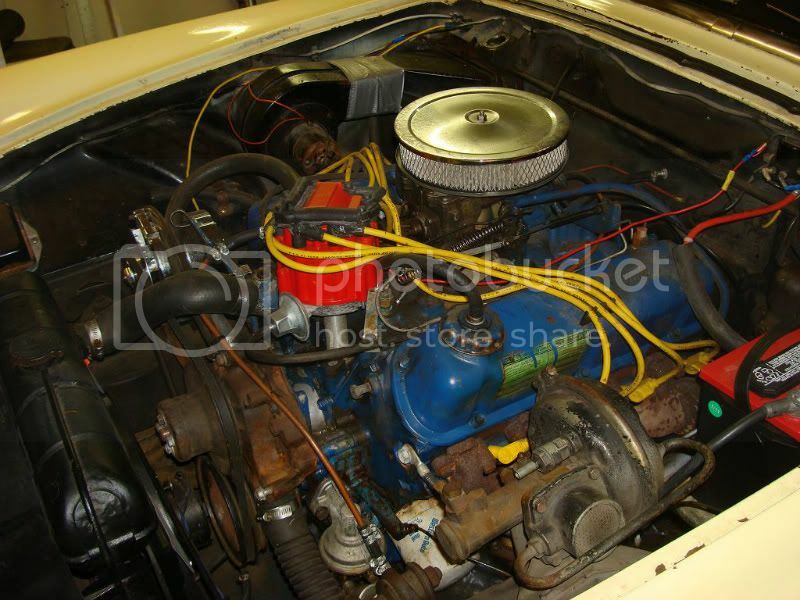 It has a late model 351 windsor engine and C4 transmission. It runs pretty well but needs a complete brake job. This car originally had power brakes and while the booster is still on the fenderwell it's been disconnected. I would like to get the brakes back to the original configuration but I'm not sure how the PB booster operates.... vacuum? Any recommendations regarding vendors/parts suppliers would be appreciated. Call Old Irish Dave, and switch to disk brakes. Drum brakes don't work very well and the booster is too light to do disk brakes. Since you are changing boosters, get a good dual-stage 8" with a 1" bore M/C. Dave sells the combination for ~$200. He sells MBM brake components and has them in chrome for ~$25 more. Give Dave a call and tell him I sent you. He's in NM at 575-544-4729. For calipers, you can either change your spindles to Granada/Versailles type or buy a bracket that uses your spindles and S-10 calipers & pads. This setup is available from Scarebird.com. Disk brakes will make your car stop just like a modern car. Warning: If you do disks, you will need seat belts for your passenger. Next, Dave's recommendation to switch to disk brakes is good advice! Several ways to do it as he mentioned, use quality parts and if you buy a complete kit, make sure you ask if ALL the parts are included. I was pleased with my kit from CASCO which would allow me to retain my 14" KH wire wheels. Some conversions require a switch to 15" wheels. Buy the parts from an experienced vendor so you can get help should a problem arise. Many suppliers on the online auction site offer incomplete kits or parts that don't fit and of course once you buy it, no product info or support. Old Irish Dave comes highly recommended. All the 55-57 parts suppliers have the parts to make the conversion. I have manual disk brakes on my 57 and they perform much better than the power drums did, especially from highway speeds. The old drums fade very quickly. Enjoy your car and the improved stopping power! I left a note in the welcome section for you also. I am - as well as Dave D - looking forward to seeing pics of your 351ized 57. We are pretty limited on space when it comes to adding a standard booster with the Master Cylinder on the end. At least with the Y-Block. Another thing that limits us of course is the way the hood opens and the latch bar. Pics of yours would be nice to see how it all fits in there. Most here have gone to the Scaredbird adapters and I believe that is the way to go also. Parts lists come with those brackets which helps to source the parts like rotors etc locally. The Granada/Maverick/Versailles spindles are getting hard to find and do take a lot more work. I have not talked with Old Irish Dave (OID) about what he has but that is a good suggestion. I will call him also as I am about ready to do the disc conversion myself. Dave D mentioned in another thread that he also has a good price on the proportioning valve that you will need also. The kits that can be bought from the Tbird vendors utilize the stock booster so it will work but as Dave D said it would be better to have a more modern (and new) booster. Plenty more to come but that should get you started. While I use my TBird a lot, I can understand if you don't want to change to disc brakes. I haven't, and find my brakes work good enough. As far as the diagram for using your present power brake unit, get a manual named 1955-57 Thunderbird parts Illustrated. That shows you the brake system. I have a 56 and not sure if the system is identical, but I can send you some pictures of mine. I will need your email address. Mine is pts1231@verizon.net . email me. As far as parts go, your booster can be rebuilt. The booster works on vacuum, supplied from the intake. With the right fitting, you should be able to take if off the intake of the 351. The other parts can be purchased from the early TBird parts suppliers. I recommend CASCO (Ohio) as not only can they supply parts, but they also have a very good tech line for getting information as well as actually restoring TBirds.. . Another good supplier is Tee-Bird Products in PA. but they don't seem to be very tech oriented. If you haven't already, I recommend you join CTCI (Classic Thunderbird Club Int'l). They are exclusively early Birds, stock or modified. They sponsor Int'l and regional shows and their magazine is is great. You might want to see if you have a TBird club locally. I know there is a very active one in Connecticut. Last edited by paul274854; March 6th, 2012, 12:20 AM. Another thing to keep in mind if you do the conversion. The swap to the Granada spindles may set the front wheels out an inch or more. This can be overcome by different backset wheels. We have a couple in our club and the wheels are noticably outboard from where they should be when you follow them in traffic. I wanted to retain my 14" wire wheels, and found a complete kit that worked and retained the stock spindles. Its a bit more expensive that way, but I didn't have to change the spindles or buy new wheels. Good luck and ask questions. Lots of help on this forum. Thanks for the replys, although I am not sure if disc brakes are in my future I like the enthusiasm. I've attached a few pics, the car was someones hot rod. I don't know what happened to the wheels/tires, I'm sure the guy I bought the car from sold them off. Is that Inca Gold (Y) or Sun Gold (G) on the Data Plate? I like the Gold. 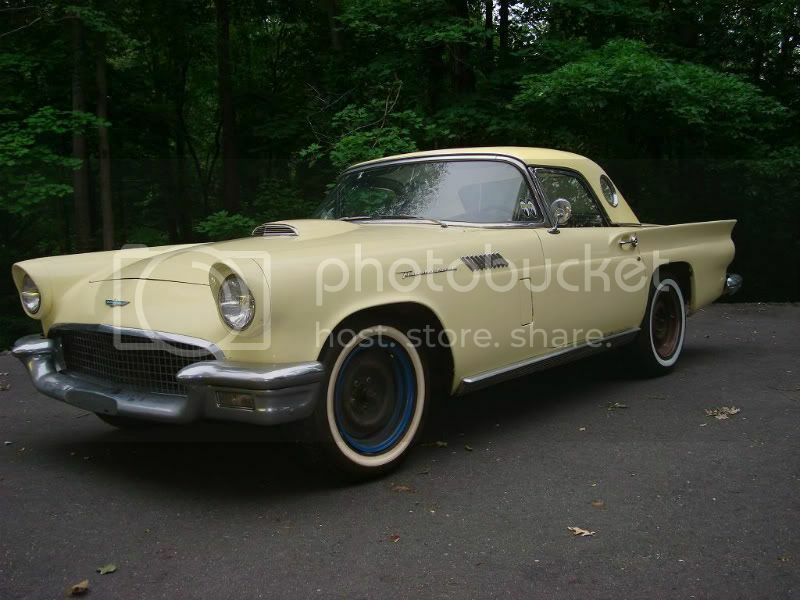 I was looking for a Goldenglow Yellow 56 when I came across the Thunderbird Green. Here is another useful site for general 55-57 info. Dot Lang who is one of the "Grand Dames" of Thunderbird Lore and History has that site. She also has a 57. The 351 looks great in there. Does it look like there were any major problems getting it in there? I would suppose the performance is a lot better than our old Y-Blocks. It still looks like a tight fit to add a booster on the firewall from what I can see. Since the booster was disconnected were there also other changes made to the brake system? Does it have a dual Master Cylinder? I see you have a '65 Vette also. I graduated from HS in 65 and always had a fondness for that year. Drop in a pic of that if you get a chance. What are you running in it? Mark, I think I have the wrong idea about what you want to do with your car. Automatically, I made a wrong assumption that modifications are ok because you have a 351W/C-4. After re-reading your posts, I get the impression you would like to restore back to 'original'. I'd like to keep it as close to stock as possible, further I don't think a disc brake conversion is necessary. We've had several cars over the years with stock drum brakes and never had any issues. I did go into photobucket and change the picture size to 800x600 as you suggested. I don't see much of a change in the pics though??? This car was originally Raven black with red interior, at some point in it's life it got a make over. My wife likes the yellow so if I can save the paint I will (it's not real good). Further she wants white interior! 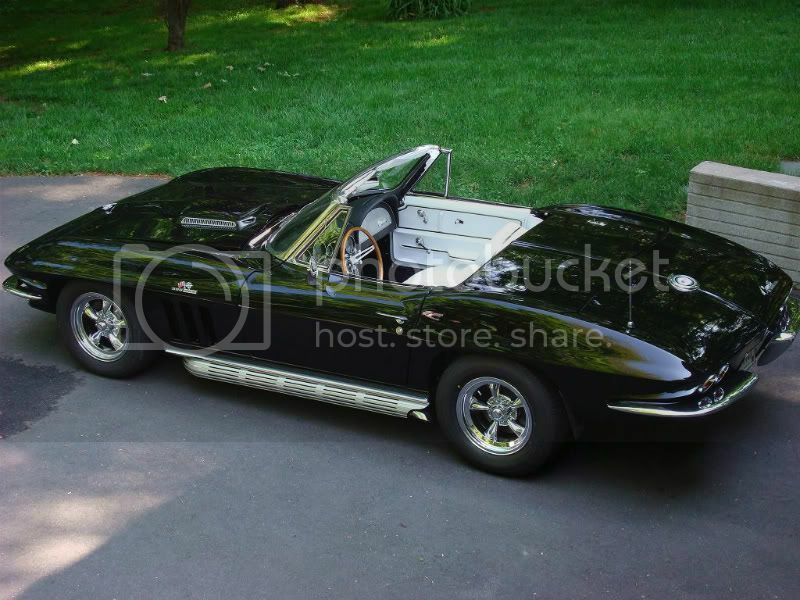 Our '65 Vette is a real 396 car, we bought it as a basket case in 2004 and did a complete frame off resto. Fortunately the TBird doesn't need that amount of work. The Tbird was originally black (AA) with red interior (XH), but sometime in it's life it got a make over. My wife likes the yellow so I will try to save it, it's not real good, an older paint job. Further she wants white interior! So returning it to it's original color combo may not happen. But I never say never. Our '65 Vette is a real 396 car we bought as a basket case in 2004, this car is restored to it's original configuration (to the best of my ability). Pretty Vette! That is really sharp. I had forgotten about the Turbo Jet 396s with that unique hood. They have a whole different rumble that sounds really mean. I probably would keep the wife happy and the yellow is more unique than the black. The Vette is an absolute BEAST to drive, 450hp and no power anything. One really needs to pay attention with it. We had been looking for a '57 TBird for almost two years and most of what I looked at were rust buckets. This car is the best example out of several, with the exception of pristine originals that is. Once the brakes are done I'll make sure the steering and suspension are secure, then sort out the drivetrain. We may need a new gas tank, time will tell. CASCO was prompt with delivery of their catalog and it seems they have all the parts for the brake system. My plan is to start that work mid-April. I'll keep you posted with progress. Thanks again for the welcome and parts suppliers. Now THAT is a Vette!!! I like up to the 67s. 68 on and especially the new ones are just not of the style I like. I'll bet it is a rush. Glad it looks like you can get what you need fairly easily. Front and rear sway bars are on my list also. I was just about ready to start my break work when I developed some fuel problems. Fuel pump went out and with everyone on the other threads talking of gas tanks I ran my bore scope down in mine and it is in pretty bad shape. I just ordered a stainless steel tank and will be replacing that before the brakes. It was a toss-up to go with the regular tank or stainless but thought it better to go with the stainless. Plan to have that done in the next couple of weeks. I'll post pics and a narrative when I get started. I'm going to put in an electric fuel pump also.